What puzzles me is that by then we had already proven our commitment several times over. Why did we write this (in the early months of tent living in Kauai after the hurricane) after we had just taken action — at huge cost to ourselves, our finances and livelihood — that proved these values, proved we were doing that very thing? 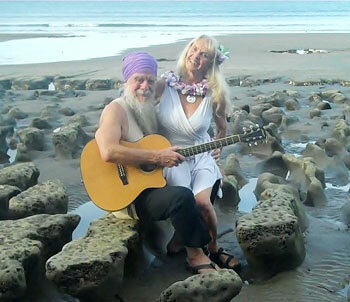 We had just, at the cost and the loss of everything we had given our lives, money and energy to for 20 years — including the loss of family, sangat, businesses, reputation, leadership in the ministry and community — resigned our positions in the devoted white-garbed international spiritual yoga community we had spent 3-6 months of every year for 20 years building up. The amazing thing is that this was the second time we had lost everything by taking action to support our values. The first time was also at huge cost to the careers — celebrity lives as rock star and movie star — we had spent years building up. We had each separately abandoned the world of fame and fortune 20 years before to throw our lives into our yoga organization as committed leaders of a center, and to live lives of integrity to help build a better world. So why did we feel the need to affirm yet again? We had learned so much from our guru, especially about how power corrupts and cult power undermines and betrays virtues and values, perhaps the most valuable lesson of all. Were we scared of the power we were feeling? We were indeed experiencing power from within, having powerful visions of a new world, and our role in it, first with Yogananda at Encinitas Hermitage (called “The Seat of the Goddess”), and now in Hawaii (land of Goddess in many forms) with the Inner Goddess energy showing up. So did we fear that we too could wind up as a predator exploiter psychopath leading a power-hungry cult? I don’t know… but what I do know now, is that that signed paper must have held us in truth to each other at all costs, supporting the growth of power of respect, love and adoration for each other. What really matters? What do you prioritize? What is your commitment to it?